When you should look at UOB bank stock? 6 month ago, i met a chinese speaking Aunty investor in one of my seminar, she only trade the bank stocks. UOB and DBS. I ask her why, she told me the rest of the stock is too confusing, what she know is that Bank will always be there, they are back by the government and if bank were to collapse. Everyone in Singapore will going to be broke anyway. She told me every year she just need to make 4-6 trades and that will be more that enough for her whole year expenses (She dont really spend much). I ask her so how much you made each trade? I was quite shock when she say 7-20k, that means everytime the amount she buy with her cash will be 400-600k. That is pretty good deal for her remisier! She only buy when price is low. BUY low Sell High actually work, but not on penny stocks. What I see is Rich investor always buy that will still be around in the next 20years and the stock in definitely do better in the next 20years. That is why when they buy during price correction, they dont mind holding for a while more. 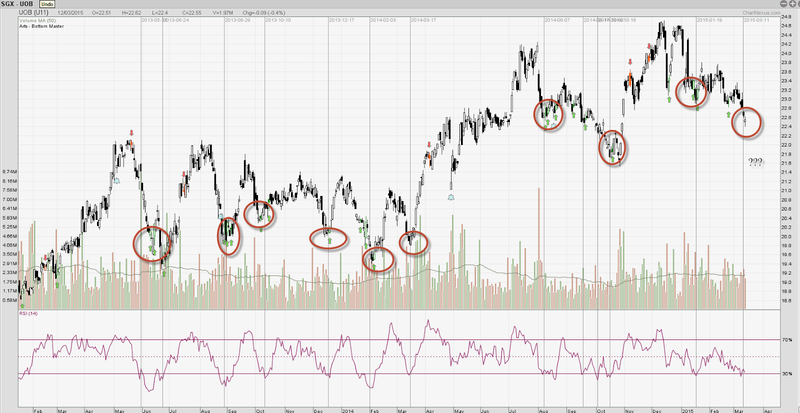 Looking at the UOB chart with RSI indicator, everytime RSI go below 30 the stock is in oversold position, and it seems like it is working well for the past 2 year. If interest rate is going to rise in 2015, banks are likely to benefit from it. Will UOB move higher from here? This Thursday Stock Market Seminar! 17 Years old Wolf of Wall Street! Why Vard is Dropping So much today! Healthcare related stock more defensive?